LeafProof makes surface tension work for you, the homeowner. The S bend causes the water flow to reverse and churn, which slows the momentum of the water as it comes off the roof. The S bend also permits the portion of the Leafproof panel which covers the gutter, to be installed at a fairly level slope. This reduces the speed of the water even more. As a result, when the water flow reaches Leafproofs water channel, the water flow once again reverses and drains into the gutter. There are other gutter covers on the market that work in a similar manner. However, these gutter covers do not have Leafproofs patented S bend. This means these covers must be installed under the second row of shingles and are often screwed or nailed into the roof. 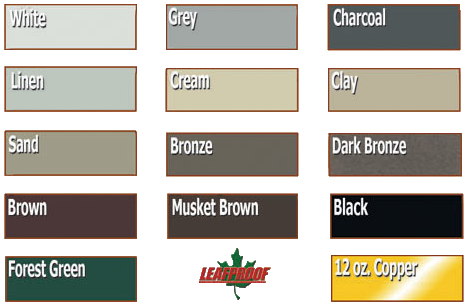 Leafproof is a solid aluminum gutter cover that installs over existing gutters without penetrating your roof. The patented S-Bend slows the flow of rainwater, causing the water to adhere to the Leafproof panel. 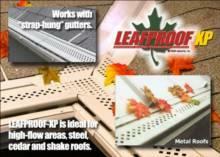 Leafproof is a solid aluminum gutter cover that installs over existing gutters without penetrating your roof. The patented S-Bend slows the flow of rainwater, causing the water to adhere to the Leafproof panel.The Leafproof System can be installed on any type of roofing, including shingles, slate, metal and tile, and on any roof pitch. Leafproof- XP is ideal where extreme protection is needed. XP was designed to handle rainwater in high flow areas like metal, slate and tile roofs; as well as roof valleys. The small, diamond vents allow rainwater to flow into the gutters while keeping leaves and debris out. 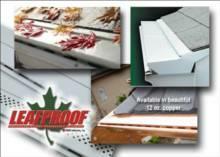 The Heated Leafproof System is available for homes in northern climates. The system keeps leaves and debris out of your gutters AND completely eliminates icicle and ice dam formation.